What are some tips for integrating silence in your classroom? I began experimenting with silence in the classroom while working on my masters in education. It became such a successful piece of my instruction, I ended up writing my thesis on the use of silence as an instructional tool. When we use the word “silence” as a transitive verb, it’s negative. We speak of “silencing” someone or something as an effective form of punishment. Teachers demand silence as a way to settle boisterous classes. The U.S. prison system imposes solitary confinement as a punishment for egregious behavior. Parents invoke the dreaded “time out” with uncooperative children. Our own Constitution has been amended to include a legal entitlement to silence in order to protect us from harming ourselves with our own words. Silence, and the emptiness it creates, clearly can be threatening. Many of us as teachers have been conditioned to think that silence equals apathy or lack of understanding, so we dole out constant stimulation that essentially directs the student by telling them what to do and how to think. Many of us were never taught and never rewarded for considering the whole student within the educational environment. The whole student includes a unified mind, body and spirit, and teaching this student requires going well beyond mere cognitive aspects. It requires an experiential understanding that recognizes, appreciates and employs the union of student, teacher and present moment. Silence can become a medium for learning, connecting students to the subject matter and themselves in a more meaningful way. A mind properly emptied of non-essential stimulation becomes open to the possibility of deeper learning, sharper concentration, enhanced creativity, and communal engagement. Silence, which has traditionally been considered wasted class time, should be viewed as an opportunity to foster reflectiveness, solidify learning, and enhance memory. When students feel safe and recognize openings in the learning process where thoughts will not be interrupted, they are more likely to take academic risks. Silence gives students the opportunity to step into a place of calmness, allowing them to access their inner faculties, voice, and beliefs. Silence creates gaps in habitual thinking that benefit all, including the instructor. Silence slows down the entire process. This syncing effect brings the entire class to the same starting point. When we slow down, we begin to authentically see, feel, and connect. Too often the minds that enter our classrooms are distracted, fragmented, and hectic. If thorough, engaged instruction is to take place, both the teachers and students must learn not only to recognize discursiveness of the mind, but also to competently deal with its distractions. Even in its simplest form silence can have dramatic effects. This practice with the daily curriculum takes a concerted effort. School intercoms, ringing bells, adjoining classrooms, and hallway movement—all of these thwart the beneficial effects of silence. How can we expect a student to contemplate new information and experiences in order to discover what they think when other voices or sounds continually fill the space? That’s our Essential Question as we strive to create a new space. Here are some thoughts about how to make space for meaningful silence in the classroom. Prepare students for the change in habits and routines. Let students know that you will be integrating a moment of relaxation (remembering that the actual word “silence” can initially sound punitive to students) and challenging not just them but yourself to find stillness. Talk about the benefits of silence, quiet, and stillness. If you are also practicing new habits of stillness outside the classroom, you can honestly share your struggles with this, the temptations of devices and noises and efforts to overcome those interruptions, and the rewards you’re seeing from a new practice. Creating space not only applies to mental landscapes but also physical environments. By leaving open, uncluttered areas on walls, shelves, and tabletops, a non-constrictive atmosphere greets students as they enter. Arranging desks in a semi-circular pattern has the effect of opening a common area, enriching and fostering the community environment. This arrangement establishes and fosters non-verbal contact. As much, if not more, communication happens at the non-verbal level than at the verbal level and face-to-face contact rather than looking at the backs of each other’s heads allows students to read facial expressions, notice gestures, and generally practice more attentive listening. A teacher who utilizes pauses in the “performance of teaching” is creating dramatic space—contrast or emphasis on the subject matter that can’t help but draw attention. Beginning a class period with one minute of quiet time, merely for relaxation, allows students’ bodies, minds, and spirits to rest in a shared moment. Once synchronized, they may be more able to fully apply themselves to the material at hand. This can be as simple as a bell tone on a cell phone or a chime. Ring it once at the beginning of class and model the behavior you wish to see–a relaxed and still body, unfocused eyes, slow, deep breathing. As students become more familiar with the process, the length of time can be extended from 20 seconds to several minutes. As much as possible, distractions should be ignored during this time. Ring the chime again to signal the end of the restful time and the beginning of engaged thinking. These moments can be taken at any point you feel students need to recenter and refocus. While it will likely feel a bit awkward the first few times you attempt the technique, I encourage you to keep at it. Students will begin to find their place–themselves–in those moments. If you are really curious about their individual journeys, ask them to journal about each experience. Silence can have profound implications in the teaching environment, especially for gifted and talented students with busy brains and active hearts. I encourage every teacher to try building brief moments of silence into his or her daily routine. See what blossoms! 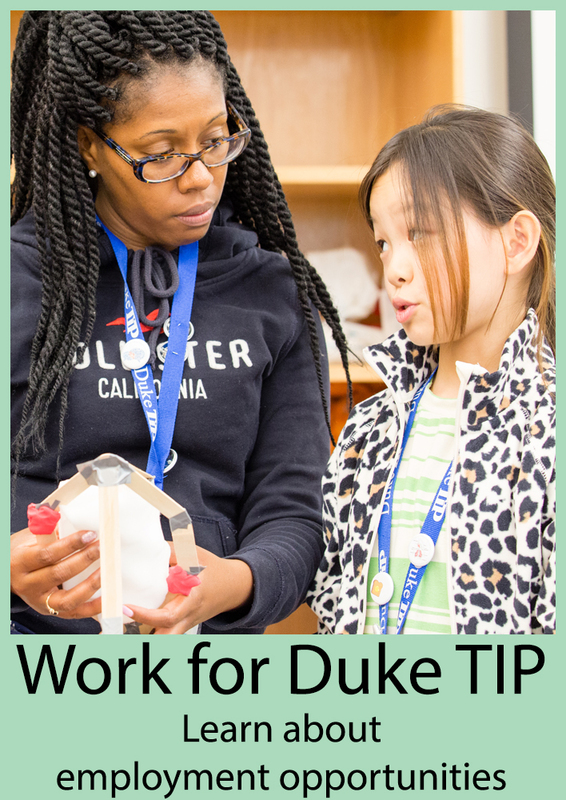 David Gaines is an Educational Programs Coordinator for Duke TIP. David taught middle and high school English, Journalism, and Creative Writing for almost two decades before joining TIP. He earned his Master’s in Education from Naropa University. I agree with this. Just this year in my school the counselor has been helping faculty learn about using mindfulness in the classroom to center and focus students, a very welcome development. I learned long ago a technique that a graduate professor of mine used which seemed awkward at the time but was effective for my professor’s classes and which I have used with variations ever since. When we were in the seminar room at the beginning of class, the professor would take about three minutes to make eye contact with each student and quietly and genially say hello. I now do that with my sixth graders every single day we are in class (we say hello in Latin since I am a Latin teacher), and everyone knows that class does not begin in earnest until everyone has been greeted and had a chance to greet me. In addition, no one is allowed to unzip pencil pouches, rearrange books on desks, look at a video screen, tap their fingers on the desk (we call it “calm hands”), or anything other than wait in respectful silence to be greeted or listen to others greet and be greeted. It is one of the best centering and focusing things I have ever done as a teacher and it has gotten more effective as I have insisted on silence and calm during the process. What’s more, I know the students value this time because if I forget someone they immediately let me know! Thank you for this discussion of an important aspect of effective teaching. David, the mindfulness movement is certainly spreading! Thank you for the additional technique. All too often, we teachers spend those few minutes between classes doing busy work – to the detriment of our students. I had to force myself to make a conscious effort to stand at my door so that I could greet my students as they entered. Like it or not, they were forced to engage me, and I could see the difference it made. Great post! One of the most useful pieces of teaching advice I received when I first started teaching was not to be afraid of silence–that asking a question and then allowing enough time for students to think about it is an important aspect of teaching. I’ve tried to incorporate more mindful silence as you suggest to varying degrees of success–I like your suggestion of beginning with a minute of silence. I think that would be a very useful starting point. Thanks! Thanks for the feedback, Monica! In the beginning, those periods of silence are just as uncomfortable for us as they are for the students. I found it helped to genuinely consider the question I just asked as if it were new to me. I paused to remove myself from the teacher context and consider the question based on my experiences and newly gained understanding – which is exactly what we are asking our students to do! With continued use, the dividends increase!